ST. PETERSBURG, January 10 (RIA Novosti) - Russian researchers obtained the first sample of transparent ice from the water of a unique sub-glacial lake in Antarctica during drilling operations on Thursday, Russia's Arctic and Antarctic Research Institute reported. 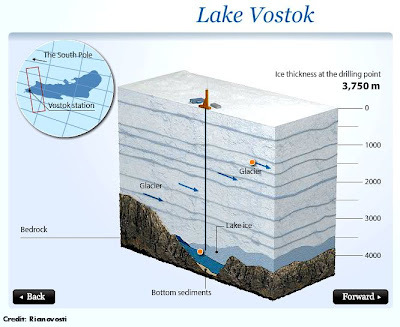 In February 2012, after decades of drilling, Russian scientists finally managed to penetrate Antarctica’s ice sheet at a depth of some 3.7 kilometers (2.3 miles) to reveal the secrets of Lake Vostok, which had been sealed there for the past 20 million years. 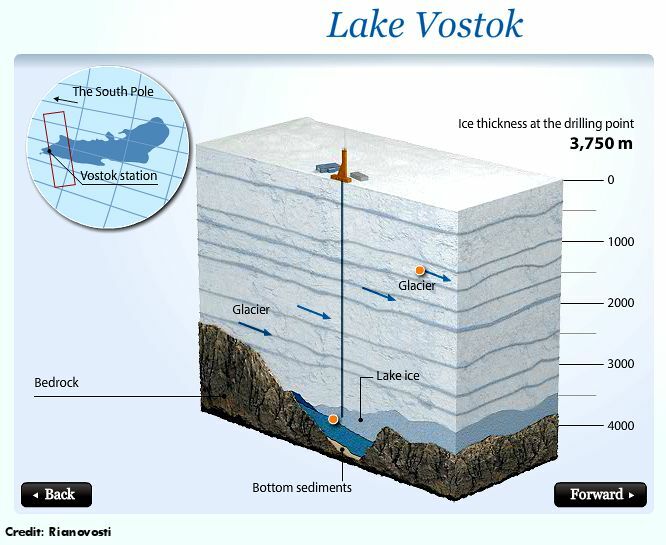 Explorers hope Vostok, which is the largest of Antarctica's buried network of icebound lakes and also one of the largest lakes in the world, could reveal new forms of life and show how life evolved before the ice age. Scientists have previously examined water samples received when they drilled deep into the lake back in 2012, but they were not sure these were samples of lake water rather than water inside the glacier above the lake. So in order to receive ice right from the lake, researchers drilled into the glacier once again in January 2013. “The first core of transparent lake ice, 2 meters long, was obtained on January 10 at a depth of 3,406 meters. Inside it was a vertical channel filled with white bubble-rich ice,” the Arctic and Antarctic Research Institute, part of the Federal Service for Hydrometeorology and Environmental Monitoring, said in a statement. The institute said the composition and origin of the new core are being determined. . . .